Saturday saw myself and Louis Rawlings have a trip down to Penzance! But first, the whole point of the trip was to photograph what is seen about. 2 DRS Class 37s, these being 37194 and 37087. 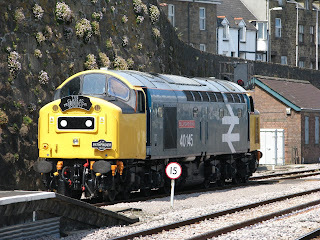 There was a very large number of spotters that came out in Plymouth alone to see these 2 beasts, and the chance to see a class 40 only around half an hour behind was very attractive for the enthusiast! While down there one spotter, decided to walk across the 2 rails to get to the other platform which didn't go down will with staff at the station, who then called the Transport Police to attend! Some of the enthusiasts there were understandably annoyed at his actions! In the words of one man "Spoiling it for all of us". 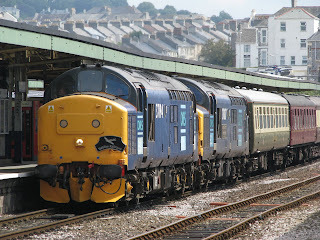 It was then down to Penzance on the Class 43 behind it, a plesent trip is the baking hot sun, down the Cornish mainline. 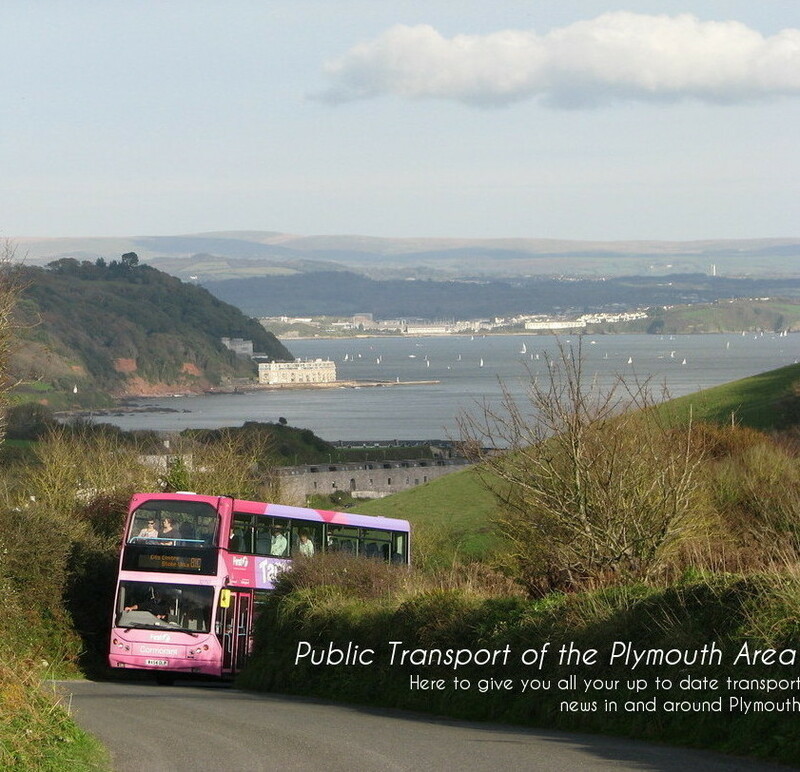 On arrival Louis was off to photograph the trains while I proceeded to my roaming grounds at Penzance bus station. There was a fantastic array of vehicles on Saturday, it was nearly like being back in time, very few low floor vehicles used, infact in the 3 hours I was down there I only saw 2 Darts and 2 B7s and 2 Solos. 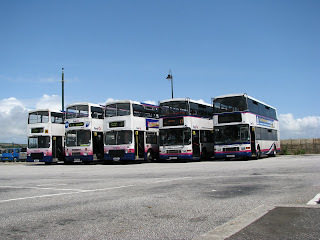 Olympians really were dominating the seafront as can be seen in the photograph, along with the odd Volvo Citybus operating Open Top route 300. 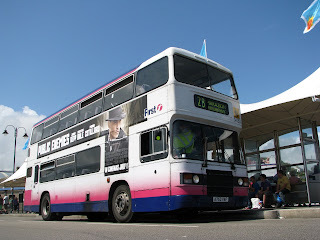 There were many Royale Olympians dominating the scene, alone with a standard Volvo Citybus. 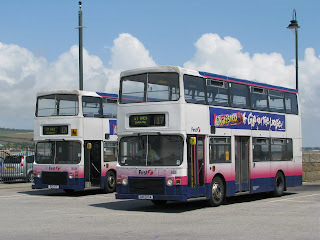 Though the highlight for me was two Alexander duel door Leyland Olympians, these being A102 FSA and B112 MSO. Not forgetting ECW Leyland Olympian A753 VAF also becoming a rare sight, and likely won't be around for much longer. And the last interesting thing was newly arrived from Bristol K623 LAE, a Northern Counties Leyland Olympian. A fantastic scene, the station was frantic! Moreso by the fact that the main streets in Penzance were closed because of a procession going through the town, making the town centre gridlocked. 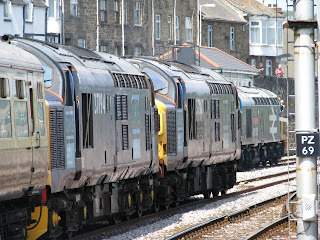 Pictures here also show both 37s and the Class 40, this being 40145 together in Penzance, so not only were be back in time in terms of buses, but also with trains! A wonderful sight I must say. 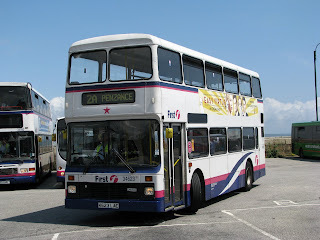 The film of the 37s leaving Penzance will soon be uploaded to youtube, some proper clagging from the beasts!